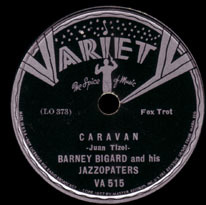 "Caravan" is an American jazz standard that was composed by Juan Tizol and Duke Ellington and first performed by Ellington in 1936. Irving Mills wrote lyrics, but they are rarely sung. The exotic sound of "Caravan" interested exotica musicians; Martin Denny, Arthur Lyman, and Gordon Jenkins all covered it. Woody Allen used the song in two of his films, Alice and Sweet and Lowdown. Steven Soderbergh used the Lyman version in Ocean's Eleven. The song appears often in the 2014 film Whiplash as an important plot element. The Mills Brothers recorded an a cappella version in which they imitated instruments with their voices. Johnny Mathis recorded the song in 1956. More than 350 versions have been recorded. The musicians were members of the Duke Ellington Orchestra, which often split into smaller combinations to record songs under different band names. For this recording, which included Ellington and Tizol as performers, the session band leader was Bigard. Santana's La Fuente del Ritmo from the 1972 album Caravanserai borrows the melodic line of Caravan, although the song is credited to percussionist James Mingo Lewis of Santana. ^ Alain, Pailler (2002). Duke's place, Ellington et ses imaginaire. France: Actes sud. p. 147. ISBN 978-2-7427-3691-1. ^ a b c d e f g h i j k l m n o Gioia, Ted (2012). The Jazz Standards: A Guide to the Repertoire. New York City: Oxford University Press. pp. 58–59. ISBN 978-0-19-993739-4. ^ "Mercury Records Catalog". Mercury Records. Retrieved 2018-09-17. ^ "Santo & Johnny Chart History". Billboard Magazine. Retrieved 2016-04-17.